Retrocognition: Can You Receive Messages from the Past? In the field of parapsychology, precognition may be hard to explain, but it is the most easily tested form of PSI under lab conditions. Retrocognition – the ability to receive messages from people in the past, even yourself – is a still harder phenomenon to prove. Though incidences abound, how do we explain communication that bends time in the other direction? 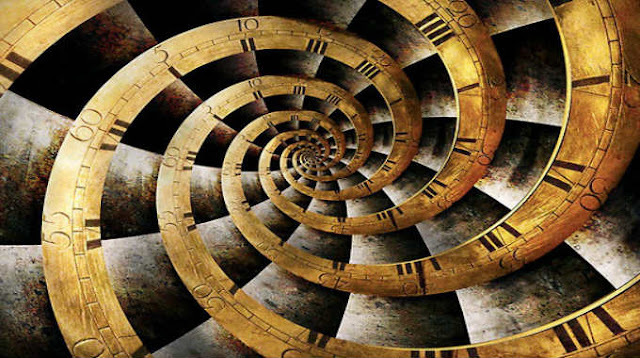 Most PSI research has focused on seeing the future, but with recent research suggesting that by changing the present and future, we can change the past, it becomes even more vital to understand retrocognition. Future Events Decide the Past? Researchers from Australia have essentially discovered that “a future event causes a photon to decide its past.” Imagine a holographic version of yourself in the past trying to send messages to you today, so that you can change your “future” destiny. Quantum researchers have even discovered “balls that don’t roll off cliffs,” as in – quantum particlesbehaving in ways we can only describe as extremely odd. Is this because matter is communicating with itself in the past, overriding present influences, even force? Some psychics can also see into the past, and even influence it with their thoughts. You may have experienced a little blip of this ability in your own experience of déjà vu. Many people with this ability can “see” into a past that that don’t even remember experiencing. Is this because their future Self changes direction, thereby eliminating the past that should be “remembered”? This bizarre suggestion is not outside the wacky world of quantum physics, where waves and particles are the same thing, and can co-exist in multiple places at different times. There are wacky theories about some of this phenomena, and there are likely charlatans who abuse it, knowing that the interest in retrocognition is rising. However, it seems odd that a whole bunch of Reddit users report receiving text messages from 2003, unleashing conspiracies inspired by popular movies like Lost and Stranger Things. Dr. Ron Mallett, a celebrated theoretical physicist at the University of Connecticut, has studied how to send messages into the past, utilizing some of Einstein’s suggestions about a 4th dimension – and we know for certain that space-time will bend and twist around super massive black holes, 15 billion times the size of our sun, so is it so unlikely that our past selves could talk to us now? Mallett has even proposed a time machine which uses laser light to send binary-encoded messages into the past. Again, knowing what we do about the weird quantum world, one cold only surmise that those messages could travel both ways. There are many cases of backward knowing, but one popular case involves the visions of visions of Annie Moberly and Eleanor Jourdain – two scholars and early administrators of British university education for women. Their experience was published, under much ridicule and defamation of character, in 1911, as An Adventure under the names of “Elizabeth Morison” and “Frances Lamont”. The book described a visitthey made to the Petit Trianon, a small château in the grounds of the Palace of Versailles where the researchers claimed to have seen the gardens as they had been in the late eighteenth century as well as the ghost of Marie Antoinette. Edward Cayce, the famed psychic also seemed to have the ability of retrocognition. Cayce described a small society of men and women who worked together in a small monastic order called the Essence Society, more than a decade before archeologists uncovered the Dead Sea Scrolls, thought to be penned by a small group of men and women scholars. Maybe getting text messages from yourself date-stamped 2003, or even 1803 are a hoax, but when you receive information that seems to offer some validity or important insights about your present or future, you’d best pay attention. The movie Back to the Future where a time traveler stuck in the past sends a message to his future self wasn’t as sci-fi as we may have chalked it up to be.